As expected, candies and toys are big sellers this year. But just how popular toys are may be a bit of a surprise. According to Walmart, Easter is the number 2 season for toy sales, only beaten out by the Christmas holiday season. And we aren’t talking just about stuffed Easter bunnies. Walmart says some of the most popular toys this Easter are the Barbie Mermaid Tale Doll Beach Doll, the Disney Ballerina Princess, select Lego items, the Lalaloopsy doll, and the Beyblade XTS Half-Pipe Battle Set. 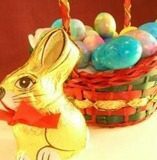 As for Easter necessities, green Easter Grass, plastic Easter Eggs, and Easter Baskets are popular items. Walmart claims that Walmart shoppers buy so many eggs that, lined up, they could circle the world. The most popular candies this year? Walmart says 60% of customers that celebrate Easter plan to purchase chocolate. Candbury Eggs (5 pack), Reese’s Eggs (6 pack), and Marshmallow Peeps Bunnies or Chicks, top the favorites list. Walmart said that almost 90% of their customers that prepare an Easter meal plan to cook it themselves, rather than purchase something pre-made. They also said that Moms are providing larger gifts to older kids, moving from trinkets and toys to items like clothing, electronics, and gift cards.